Sen. John McCain pronounced President Trump's objections to the sweeping sanctions measure he signed Thursday "misplaced" and said it was "critical" that Mr. Trump comply with and implement the act, as signed. "The concerns expressed in the President's signing statement are hardly surprising, though misplaced," McCain said in a statement soon after the president signed a bill which limits his ability to unilaterally alter sanctions against Russia, Iran and North Korea. The Arizona senator also took the opportunity to take a stand for the powers of Congress, which rival the president's. 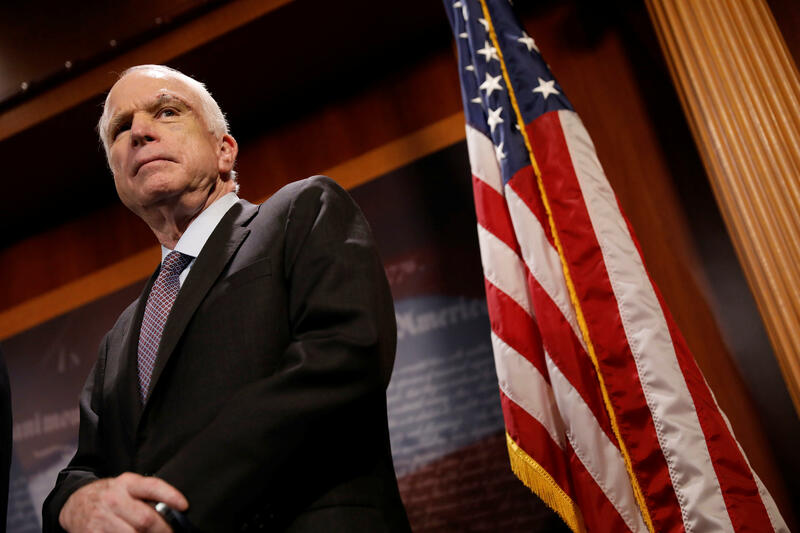 "The Framers of our Constitution made the Congress and the president coequal branches of government," McCain wrote. "This bill has already proven the wisdom of that choice." That was a direct jab at the president, who, in a press statement had called the sanctions bill "seriously flawed" because of the limits it imposes on the executive branch's ability to "strike good deals for the American people." Mr. Trump declared, "The Framers of our Constitution put foreign affairs in the hands of the President. This bill will prove the wisdom of that choice," that is, that Congress would come to regret the sanctions legislation. The president's signing statement went further, suggesting that some of the bill might not even be constitutional. "In its haste to pass this legislation, the Congress included a number of clearly unconstitutional provisions," Mr. Trump wrote. Mr. Trump ultimately said he was signing the bill "for the sake of national unity" because "It represents the will of the American people to see Russia take steps to improve relations with the United States." McCain also had an answer for that line. "While the American people surely hope for better relations with Russia, what this legislation truly represents is their insistence that Vladimir Putin and his regime must pay a real price for attacking our democracy, violating human rights, occupying Crimea, and destabilizing Ukraine," McCain wrote. "On this critical issue of national security policy, it was the Congress that acted in the spirit of national unity to carry out the will of the American people." McCain's pointed reminder about the equality of the legislative and executive branches echoed his recent speech on the Senate floor, when he had made a dramatic return to the Senate for the health care vote, days after undergoing brain surgery on an aggressive tumor. "Whether or not we are of the same party, we are not the president's subordinates," he said on the day he cast a vote that enabled the health care legislation to be considered in the Senate. "We are his equal!"